Every year, at the end tail of summer, thousands of people from all over Pontevedra set out walking to reach the same place: the Os Milagres de Amil sanctuary, in Moraña. The pilgrimage starts off from several places. From the provincial capital, for example, hundreds of pilgrims walk throughout the night, crossing valleys, hills and villages, to arrive very early in the morning at the church, where votive offerings are placed and prayers are said asking for miraculous cures. Legend has it that this devotion began in Amil thanks to a mule driver. His name was Sebastián de Castro and, at the end of the eighteenth century, he saw his crops being ruined by a lengthy drought. After asking the Virgin for help, he started digging in A Roza Vella and, miraculously, found water. He built, in gratitude, a fountain adorned with a carving of Our Lady, a construction that still exists very close to the current sanctuary. Because, once the site’s fame reached his neighbours’ ears, it soon became clear that the place where Sebastián de Castro lived was not the best location for devotion. Very close by, in A Chan, the present temple, of neoclassical design and really unique architecture, was built soon after. Firstly, because it is an octagonal building with a simple portico of Renaissance airs, with pediment and columns in the style of the times. Also because of the beautiful entry staircase, from the twentieth century, that goes up the hill where the sanctuary is located, at the top of an old castro. 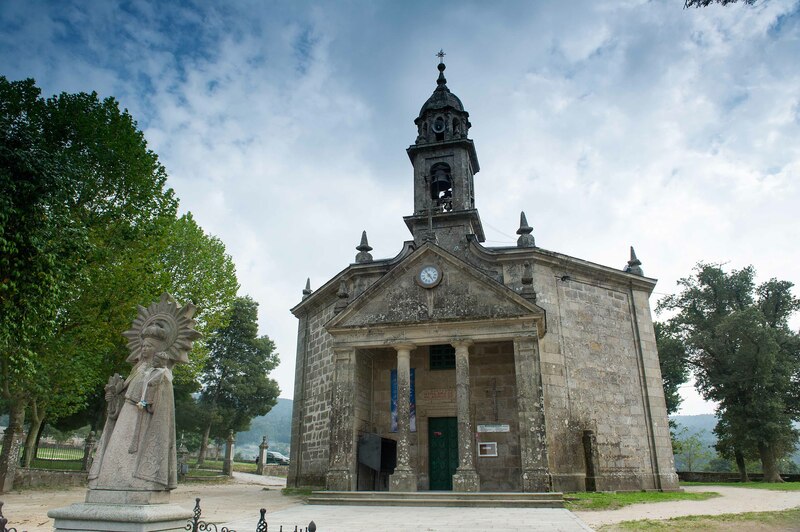 The Os Milagres Sanctuary is located in the municipality of Moraña, in the interior of Pontevedra. The attractive and the tourist pull of other regions of the province located around the Rías Baixas mean that in many occasions this area goes unnoticed among those who visit Galicia, missing out on an area of ​​great natural and scenic value. The municipality has just over 4,000 inhabitants, spread out among parishes that have a curious feature in common: many of them have a beautiful carballeira (oak forest) located by to the church. This is the case of Santa Xusta (with more than 450 trees distributed among 25,000 square meters and with a path to see them); Campenlos, with some fifty oaks; Campo de Antón, A Buzaca or A Feira Vella, smaller in extension; or Santa Lucia (next to the town hall, with a hundred oaks). In this last carballeira a fair, held annually, turns Moraña into the capital of traditional Galician cuisine for a weekend. This is the Festa do Carneiro or Espeto, in which dozens of rams are roasted for hundreds of diners. It is celebrated at the end of July and approaches its fiftieth edition. Declared of tourist interest, one must be swift in order to get a place: the meal is booked in batches of one animal for every twenty people.